Letter SI MUOVE (is on its way) as a series of talks are soon going to start. 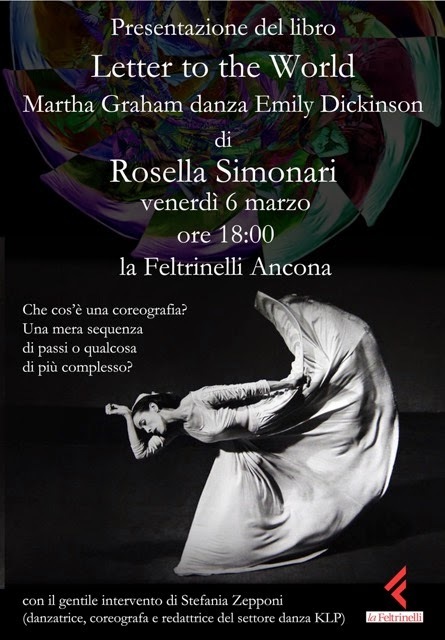 On 6th March 2015 I will be at La Feltrinelli in Ancona (an important bookshop, part of one of the most significant book shop chains in Italy), Corso Giuseppe Garibaldi, 35, to talk about Letter to the World with dancer, choreographer and dance writer at Krapp's Last Post, Stefania Zepponi. We start at 6 pm. For info: 071 207 3943.